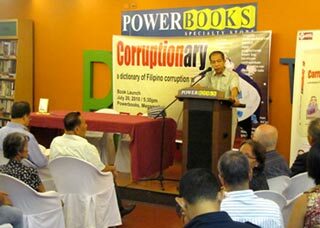 The CenPEG book, Corruptionary, was re-launched last July 20 at PowerBooks, Megamall, Mandaluyong City. Corruptionary, the only dictionary in the world containing corruption-related words, was first launched in May 2008 with a second launch in Athens, Greece at the 13th International Anti-Corruption Conference (IACC) in December that year. It is now co-published by Anvil Publishing which also did the book’s third printing. 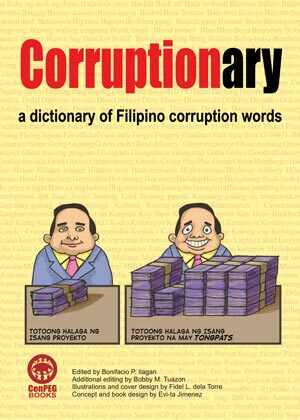 Originally written in Filipino, Corruptionary gives an English translation to word entry definitions. It is now available at the Powerbooks and all Philippine and international outlets of the National Bookstore. 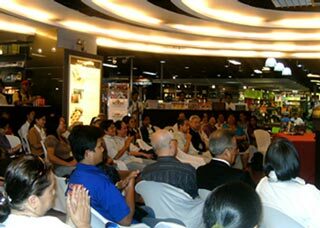 Among those who graced the book’s third launching were former Supreme Court Chief Justice Artemio Panganiban, UP Alumni Regent and AES Watch Co-convener Alfredo Pascual, former UP Law Dean Raul Pangalangan, Kadamay chair-emeritus Carmen “Nanay Mameng” Deunida, National Artist Bienvenido Lumbera, who is also CenPEG board chair, CBCP’s Bishop Deogracias Yniguez, and Dante Jimenez of the Volunteers Against Crime and Corruption (VACC). CenPEG executive director Evi-ta Jimenez, Anvil Publishing manager Karina Bolasco, Corruptionary editor Bonifacio Ilagan, film director Carlitos Siguion-Reyna, Fred Gaite of Courage, former senatorial candidate Gwen Pimentel, Mae Paner aka Juana Change, and representatives from Nassa-CBCP, the Japanese embassy, and Transparency and Accountability Network (TAN) were also present. A project of CenPEG and conceptualized by Evi-ta Jimenez, Corruptionary is a product of research by students from the University of the Philippines (Manila) who took their summer practicum with CenPEG. 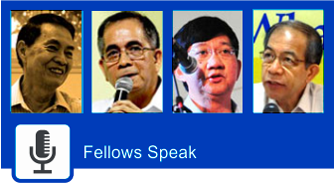 Adopted as a centennial book by the University of the Philippines in 2009, it is edited by acclaimed Filipino writer, playwright and film scriptwriter Ilagan who is also a CenPEG Fellow. Especially under the watch of former President Gloria M. Arroyo, the Philippines earned the notoriety of being one of the most corrupt countries in the world.